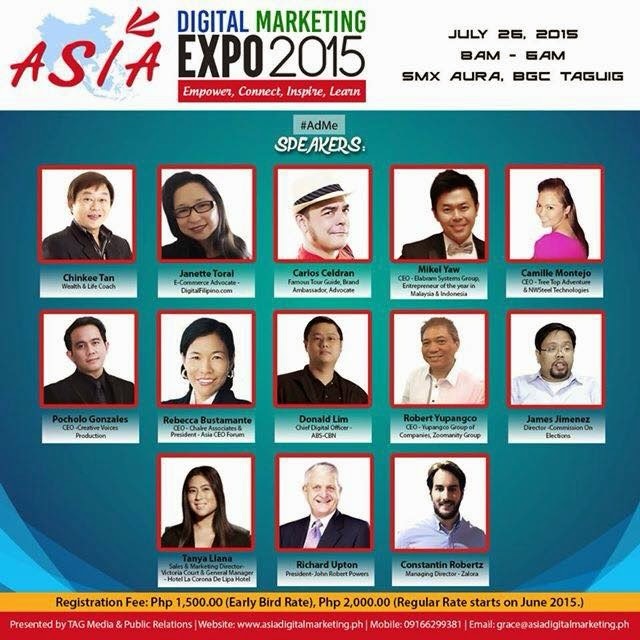 Asia Digital Marketing Expo 2015 (#AdMe) will be held at SMX Aura, Taguig on July 26, 2015 with a theme: Empower, Connect, Inspire & Learn. The Philippines is known to be the hub of everything; Business Process Outsourcing, Knowledge Process Outsourcing, Network Planning & Optimization, Investment Grade, Empowered Talents and the Social Media Capital of the World. Filipinos, more or less, are 100 million already as of 2014, while 30% are online, 100% are using mobile phones and most of us have two each, no wonder that different companies both local and international are putting up their digital marketing department as well as hiring of online strategists as part of the competitive edge of the company, and most importantly to reach the target market faster. Constantin Robertz is the Managing Director of Zalora in the Philippines. He has lived in the Philippines since 2013 and previously worked with Rocket Internet in Global Venture Development, building its e-commerce ventures around the world in different functions, working with Zalando (Europe's #1 e-commerce company), Lamoda(Russia's leader in fashion e-commerce), and Zalora(Asia's #1 online fashion destination). Before Rocket Internet, Constantin co-founded a personalized online shopping mall in Germany. He studied Business Administration in St.Gallen (Switzerland) and Singapore. Dr. Donald Lim is the Chief Digital Officer of ABS CBN. Donald worked at Inquirer, yehey.com & the Founding Officer of Internet Mobile Marketing Association of the Philippines (IMMAP). Richard Upton is the President of John Robert Powers who lives in the Philippines for 45 years and managing all the companies’ transactions in Asia. When his company first use online marketing, sales went up dramatically which made him a firm believer of the power of technology. Janette Toral is the CEO of Digital Club Filipino. Her Philippine Blogging Summit which she started 12 years ago with a yearly conference has been always a success. which she holds at University of the Philippines Malcolm Theater. She is considered as the E-Commerce Guru in the Philippines because of her contribution in different Internet & Electronic Bills which were pushed in the Philippines. Rebecca Bustamante is the President of ChalresAssociates. She is considered as the most accomplished woman in Asia because of her struggles to succeed as a Domestic Helper who became the CEO of a multinational company. Before becoming a CEO, Rebecca became the Director of Sales from an international cosmetics company in Canada. She's also the President of Asia CEO Forum & Asia CEO Awards with a series of leadership seminars monthly in the Philippines. Mikel Yaw is the Managing Director of Elabram Systems Group (ESG) with Headquarter in Malaysia & offices in the Philippines, Indonesia & Thailand. ESG main solutions are Network Planning & Optimization, Talent Acquisition & Deployment, Business Process Outsourcing & Knowledge Process Outsourcing. Mikel receives awards from HuaweiChina for the project contributions. Mikel also won different awards in Malaysia & Indonesia as Entrepreneur of the Year. For two years, Mikel participated as one of the speakers at LTE World Summit in Amsterdam & in USA and as a speaker for the upcoming LTE Middle East in Dubai this May 2015. Chinkee Tan is the famous motivational speaker with more than 200 talks a year all over the globe. He is a wealth and wellness coach, using Social Media in his advocacies and to reach his target audience. Carlos Celdran is the famous Tour Guide in the Philippines and a Brand Ambassador of different B2C companies. He is well known for his different advocaciesand became more famous when his popular "Damaso" stint at Manila Cathedral was featured in international magazines and newspapers. Robert Yupangco is the President of Yupangco Group of Companies; Zoomanity Group (Zoobic Safari, Residence Inn Tagaytay, Paradizoo Cavite, Zoocobia Pampanga, Zoocolate Thrills Bohol), YL Finance, Bel Air Transport, Nanten Restaurant, Misono Japanese Restaurant & Yamaha Music. Tanya Llana is currently the Business Strategist and Director of Sales & Marketing of Victoria Court and the General Manager of Hotel La Corona De Lipa. For Victoria Court, Ms. Llana handles targeting new market segments, innovating revenue direction and ensures social media maximisation. Victoria Court's vision is to be the perfect host and mission is to aim for genuine happiness for everyone, everyday, every stay and in every way. As the General Manager of Hotel La Corona De Lipa, she strives to give her guests crystal clean rooms & amenities, quality food & beverage, and impeccable service. At Hotel La Corona De Lipa, she believes that the customer is King. Camille Montejo is the CEO of NW Steel Technologies & Tree Top Adventure. Tree Top Adventure provides the only Motorized Team Building Facility in the Philippines & the 1st Motorized Zip Lines in Asia. Pocholo De Leon Gonzalez is the CEO of Creative Voices Productions & shared his voice to 1000 projects around the globe with more than 10 radio shows in the Philippines. He is the most popular speaker for 3 consecutive years under Laguna Blogging Summit. Pocholo was the finalist at the recently concluded Asia CEO Awards last year. James Jimenez is the Director and Spokesman of the Philippines Commission On Election (COMELEC). His topic will be “Disrupting tradition and embracing innovation” to share his expertise and experience of breaking the traditional and the effectiveness of the new technology especially in advocacy.